When are FINALLY finishing up our lovely water cycle unit and I'm so ready! 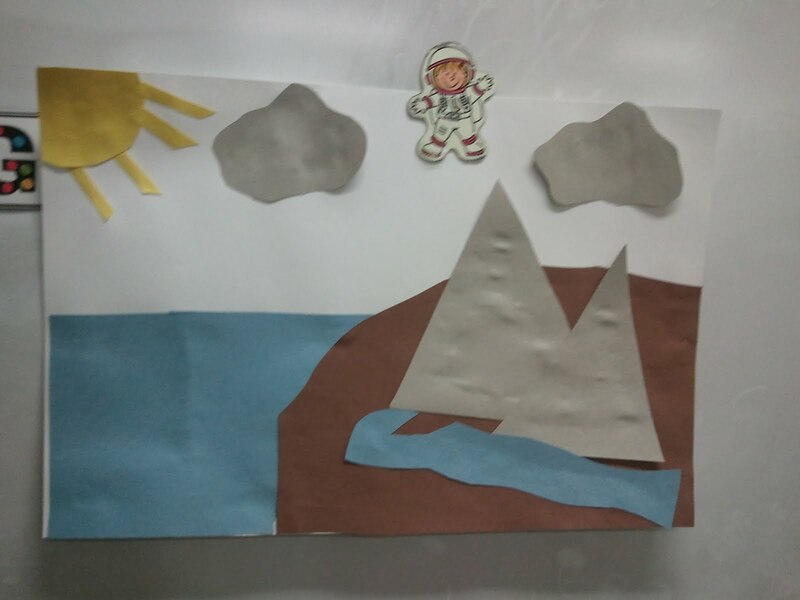 Our wonderful third grade student teacher (in another room) came up with this great paper project to give our kids a better understanding of the project. Keep reading for a play by play! 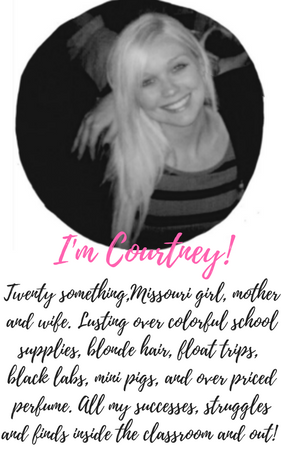 Here was her way neater than mine example! 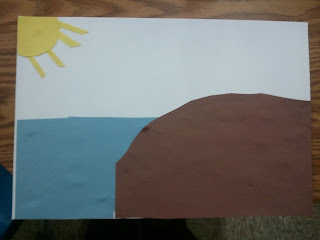 Day 1: We added a sun, liquid water, and land. 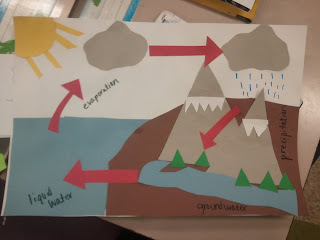 Day 2: We added our clouds and our mountains to show where rain comes and how it runs off objects and goes into lakes, rivers, and steams. 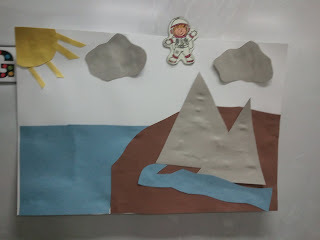 Day 3: We added our labels, rain, red arrows, trees, and snow. After we finished this we wrote paragraphs to explain to someone else what the process of the water cycle was. They turned out so lovely. I was very impressed and it truly showed who understood and who was just flying by some hairs. In order to do the paragraph I gave them the words we used and we came up with a topic sentence together. Then we decided to start by explaining that it has no end or beginning. We then went into explaining evaporation. Hope you like it! I'm super excited for Valentine's Day! I'm making my melted heart crayons this weekend! I wanted to do it last year but never found the molds. When I was in Kansas City a few weeks ago they had them at Target again. Woo hoo! I was one happy teacher. I can't believe it is even Valentine's Day. This school year is going by so fast it amazes me. There are so many things I want to accomplish and I hope I can at least touch base with some of them. Yesterday the Librarian told me you can't change the world and it was good to hear that. Sometimes I know I get so caught up in trying to fix everything and make everything right and it really isn't possible. So today I'm slowing down again and just trying to change my little world first. Next week I have a 3 day work week. We have Friday and the following Monday off so I'm taking off Thursday (half day) and flying to Dallas Wednesday night to visit the boyfriend again. 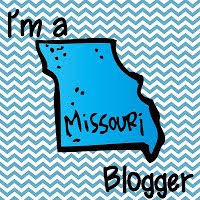 He comes back to Missouri at the end of March. I miss him dearly and can't wait for his arrival. I also love going to Texas more than anything!!! I feel like a little bit of a Texan at heart. I've spent a lot of time there in the past few years. If you ever find yourself North of Dallas in McKinney eat at Cadallic Pizza Pub. It is amazing. Have a great Wednesday! I'll be so happy in May of 2014 when I graduate with my Masters. I will fill like I can devote time to writing again. I feel guilty blogging when I have papers to write. Love ya! 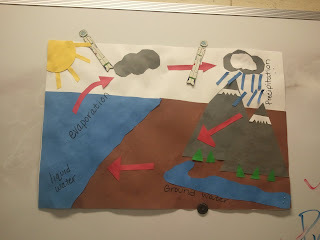 I really like your water cycle work, looks like you have made a fab job of it. I bet the children were more engaged with it by teaching in this way too, as drawing a diagram might be a little boring. Thanks Ben they enjoyed it!